“Most Sound Supervisors who sit in front of it get a short tutorial, and they're off. If they’re used to another console I can ask how they normally set that up, and simply set it up the same way." The new System T S500 Control Surface at The Hospital Club Studios, London. Simon Wall, Sound Supervisor at The Hospital Club Studios. London, UK - Solid State Logic’s System T broadcast audio production environment has been installed at The Hospital Club Studios, the inimitable multipurpose creative production facility and private members’ club in London’s Covent Garden. The installation was carried out by systems integrator ES Broadcast. The Hospital Club is a unique space - a TV and music studio, private members’ club, bar, restaurant, hotel, gallery, event space, live music venue, and much more. It was conceived by Paul Allen (Microsoft co-founder) and Dave Stewart (Eurythmics) in 2004 as a progressive media hub that could bring people from all corners of the creative content multiverse together in one environment. Since that time, The Hospital Club's broadcast facilities have developed to be counted among the most important London stages for live and recorded TV, from music and entertainment, to prime-time panel shows, quizzes, and discussion programmes. The 'black-box' studio occupies the two basement levels with ample lift access from the drive-through loading bay two floors above. The sound control room is on the same floor, with the production gallery one-up, on the first basement level. There used to be an additional audio control room next to the gallery, but that has become a new flexible gallery 'annex' that can be whatever a production demands - including an additional audio control room. The sound control room is not a typical broadcast space and feels more like a high-end music studio, populated by generous racks of classic outboard gear, furniture by AKA Design, and a plush rear seating area. It was always intended to be a multi-purpose room - practical and fully-equipped for broadcast, and a home-from-home for music producers. Simon Wall has been the Sound Supervisor at The Hospital Club for 14 years: "The whole facility was designed to be a complete vessel for creative ideas that start in the Club and get realised in the studios but in reality the studio generates most of its interest from external clients. “We still do have some creative throughput from the members’ club, but the majority of our work is television programming for commercial production companies and broadcasters" Recent shows include Frankie Boyle's New World Order, John Bishop: In Conversation With.., Richard Osman’s House Of Games, and Vic & Bob’s Big Night Out, with Strictly Come Dancing’s It Takes Two daily live show returning to the studio in the autumn. 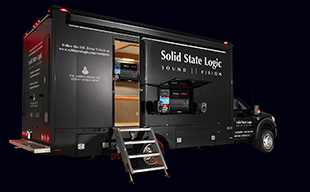 Once the decision had been made to upgrade the audio facilities, Simon Wall spent a long time considering the console options, but admits to being impressed by System T from the outset: "I had a short demo at a trade show and everything was so straight forward - the navigation, the routing... Sitting in front of this and feeling like you can use it is the key thing. Most Sound Supervisors who sit in front of it get a short tutorial, and they're off. If they’re used to another console I can ask how they normally set that up, and simply set it up the same way." Simon Wall says that one of the most obvious 'wins' has been the console's Layer Manager. Its simple drag and drop interface enables fast and easy assignment of any path types or ranges of paths to any locations across the independent fader tiles without recourse to control applications, or interrupting a show or rehearsal. In fact, users can even create completely new channels, auxes, stems, and masters, without interrupting audio, and even change the process order within paths in a drag-and-drop interface. The System T install consists of a 3-bay, 48-fader S500 control surface and a 16-fader remote fader tile in the sound control room - through the separate fader tile can be moved anywhere on the Network, and be coupled with the T-SOLSA PC control application and touch screen. In the Machine room, there is an SSL Tempest T80 800-path audio engine and a range of SSL Network I/O, including ten A16.D16 units (combination of mic, line, and digital I/O), alongside MADI, SDI and AES interfaces. There are also several movable, flightcased stage racks populated with SSL Network I/O SB 8.8 and SB.32.24 Dante stageboxes. A good proportion of the racked I/O has been set aside for the wide range of outboard kit in the studio. The facility has plenty of structured cabling to provide for the primary and secondary (redundant) Dante networks that are the main audio transport and routing infrastructure - configurable and controllable directly from the System T console screen. "It's quite a lot of I/O for many of our shows," says Simon Wall. "It won’t all get used every week, but when we have the big music shows in, it will be ready to go. We do one show, for example, with BBC Persia that has five bands across three stages in the studio, plus a guest chat area"
Wall is making the most of the Dante network and AES67 compatibility, by upgrading The Hospital Club's comms system to the new Riedel Bolero wireless system, and using a Yamaha QL-1 console (Dante-equipped) for simple PA control and stage foldback. System Integrator ES Broadcast has been responsible for the installation. "They have been great," notes Wall. "The project is not just a console upgrade, but a combination of other elements as well, so we thought we'd get someone in we knew could handle it, and had the expertise to make it happen... They've been fantastic." Other key System T features for Wall have included the fully-integrated Dialogue Automix facility. Available from any path, the system features eight independent Automix groups, slave mode, and weight control for priority. SSL Automix can be used pre- or post-fade. "Automix is key these days, “explains Wall. "A lot of shows are completely unscripted. It's great that Automix routing is incorporated into the channel strip rather than in an FX rack or separated off to another unit... It works really well." Before System T, Hospital Club already had a successful history with SSL consoles, but that was by no means a guarantee of selection this time around... "Support was a key factor in our choice," says Wall. "And the support from SSL over the last 15 years has been excellent... It's also great that System T is being chosen for other key broadcast facilities in the UK - that means freelancers will have more opportunity to become familiar with it and to appreciate it... And of course, it sounds great! It's got the SSL quality.